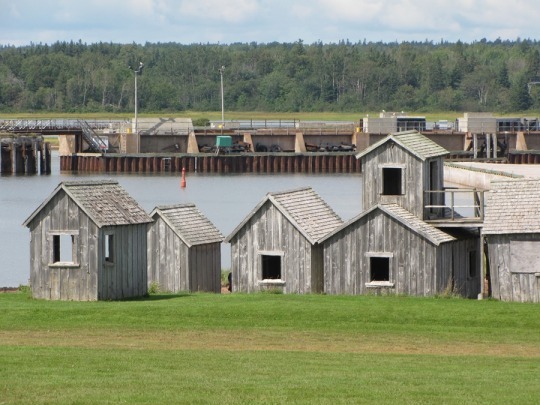 The picnic area at Wood Islands has an imaginative play area of old buildings made to look like sea shanties. I got a concussion from hitting the top of my head in one of these buildings in 1983. They also have the usual modern swings and playground equipment. This view of the playground is so odd that I am going to dig up another. Here it looks a bit dangerous. No doubt the kids and adults still talk about Mary's Bump! Mary MacADNski: The most noticeable bump was that I was pregnant for my second child and playing with my first child and my niece. I had to lie in the grass for quite a while. Quite unusual, but I like these wooden structures Mary! Mary MacADNski: I have many pictures of this playground with many varied views. Perhaps I will dig some up. Mary MacADNski: They absolutely do. I am playing with another generation of kids here now but ham very careful about where I put my head. Kinda like fun hidey-holes, Mary! Mary MacADNski: It is a great place. I will show some other shots. Oh how wonderful. I bet this is a lot of fun for the kids (and the not so young kids - sorry t ohear about your head ) I wonder why there is a bunch of flowers on the bench. Mary MacADNski: Those flowers are just tall wild flowers growing where it is not mowed. This is a very fun playground and some kids are in awe of seeing the boats. I like this Mary, like a sunken building with just a roof showing. Mary MacADNski: As I was showing this is all subject to the ferocious erosion. Very pleasing construction, is it clad with wooden shingles. Mary MacADNski: All traditional (such as my house) buildings are. Mary MacADNski: I still thin of the stars at the moment and the intense headache for quite a while. I was pregnant with my middle child so took nothing. Oh what kids wouldn't enjoy having that lot to play in. Mary MacADNski: Kids certainly do. I am playing with another generation of kids here now but am very careful about where I put my head. I like it--giving kids entire buildings to play in or on. Mary MacADNski: There are lots of picnic tables, swings and cooking shelters. Mary MacADNski: Yes, though they are looking quite worn. I am glad you survived that bump... they look great to play in. I would have a heyday in them. I love the weathered wood. I hope you have lots of fun with you grandchildren here. Mary MacADNski: I am not here that much anymore with my grandchildren. They moved to New Brunswick, our other mainland, 14 months ago. Now they come by bridge. It was the only concussion I ever had, thankfully.